Funerals of four people killed in last week’s Charlie Hebdo magazine attack are being held in Paris. Friends and family paid last respects to cartoonists Bernard Verlhac, known as Tignous, and Georges Wolinski, as well as a columnist and a policeman. At Tignous’ funeral colleagues said Charlie Hebdo would stay alive and they would not be afraid. Seventeen people died in the attacks, including eight magazine staff. Three police officers, four people at a Jewish supermarket, and a visitor to the magazine and a caretaker died. Al-Qaeda said it had directed the three militants involved to carry out the attacks. Earlier President Francois Hollande vowed to protect Muslims who, he said, were the main victims of fanaticism, along with people of other religions. Speaking at the Arab World Institute, he said anti-Muslim and anti-Semitic acts should be condemned and punished. Meanwhile Pope Francis condemned the attacks, saying it was an “aberration” to kill in the name of God. However, the pontiff said there were limits to freedom of expression and the faith of others should not be insulted. A private funeral service was held for Tignous, 57, in the suburb of Montreuil, ahead of his burial in Pere Lachaise, Paris’ best known resting place for writers, artists and composers. A ceremony was held at Pere Lachaise for Georges Wolinski, who is to be cremated. Meanwhile friends and family are also attending funerals for Charlie Hebdo columnist Elsa Cayat and Franck Brinsolaro, a policeman assigned to guard the magazine’s editor Stephane Charbonnier. 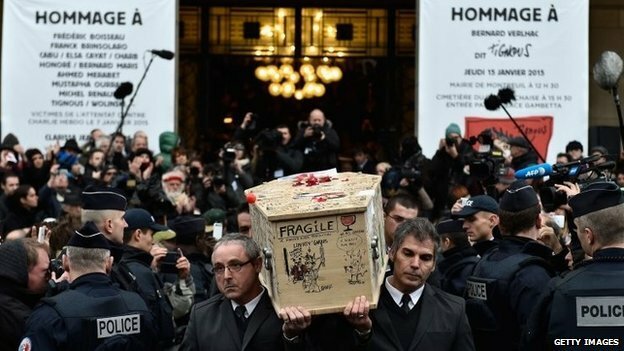 Crowds in Montreuil applauded Tignous’ coffin as it arrived for the ceremony at Montreuil town hall covered in drawings and messages from well-wishers. In a tribute at the ceremony, Tignous’ colleague Corinne Rey described him as the “king of jokes”. “Our magazine will live, it will be a different magazine,” she said. Also speaking at Montreuil, Justice Minister Christine Taubira said the dead cartoonists were the “guardian angels, those who watch out to make sure democracy was working” and the “face of France, obnoxiously assassinated”.